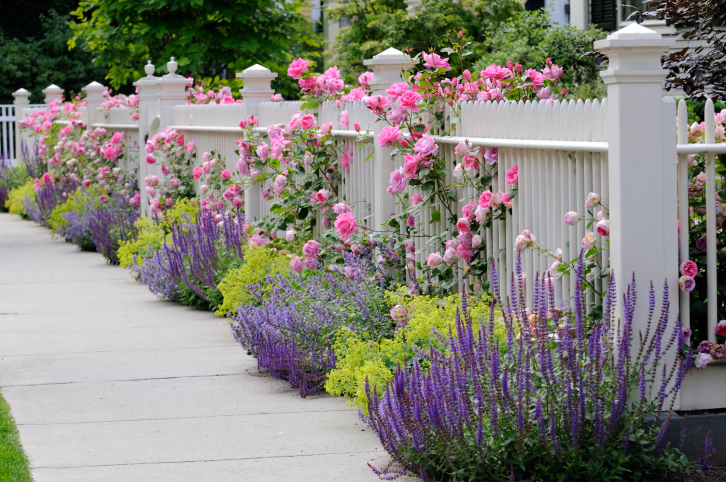 This beauty could be your yard if you give us a call for spring fence installation! We’ve written in recent weeks about springtime fence issues like spring cleaning your fence and decorating your fence for spring, but we had a thought. What if you don’t even have a fence to clean or decorate? If that’s the case, then you’re in serious need of some springtime fence installation. Here are some things to know and consider if you’re looking to add a new fence to your home or business this season. As the weather continues to trend in a spring-y direction, you’ll want to get outside and enjoy your outdoor living space as much as possible. A new fence can add to that enjoyment in a multitude of ways. It can add aesthetic value, like we discussed in our spring decoration post and in other posts, including this one about the curb appeal of a new-looking fence. In addition, fences add a ton of safety and security to your yard and home. Whether it’s in keeping intruders and wild animals out, or keeping children and pets in, a fence works great for controlling entry and exits from your yard. If you own a business in Northern Virginia, spring can be a great time for some fixer-upper projects around your building. If you’re looking to add some security this spring, check out our high-security options. That being said, some of our more simple (but still sturdy) fences can add security while also adding a visual charm. That’s where ornamental aluminum can help. Spring is truly a great time to install a fence in Northern Virginia. The ground is no longer frozen solid, and as long as there’s no heavy rain nearby (don’t worry, we’ll check the forecast when planning your fence installation), it’s hard to get any easier than working outside in the beautiful springtime sunshine. If you’re interested in adding or replacing a residential fence this season, please go ahead and give us a call! This entry was posted on Thursday, March 31st, 2016 at 8:24 pm. Both comments and pings are currently closed.